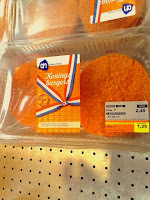 Despite what Fox News may be spoon-feeding its audience, I wouldn't describe the Netherlands as a land of sin and chaos. I'd say the Netherlands is more like a land of jolly people who like to carry things on their bicycles and enjoy milk and sandwiches for lunch. Except on April 30th, the one officially authorized and celebrated day per year of rampage and havoc throughout the Netherlands. 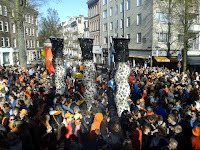 Every year on April 30th, the Dutch would morph into orange rampage-prone monsters and destroy their urban habitats by burying the city under plastic glasses and empty cans of beer. All this to celebrate Queen Beatrix's birthday. Beatrix's birthday is in fact in January but the Dutch, practical creatures, have come to terms with the reality that weather in the Netherlands is often too snowy and generally inadequate to have the people embark on proper royal birthday celebrations in January. 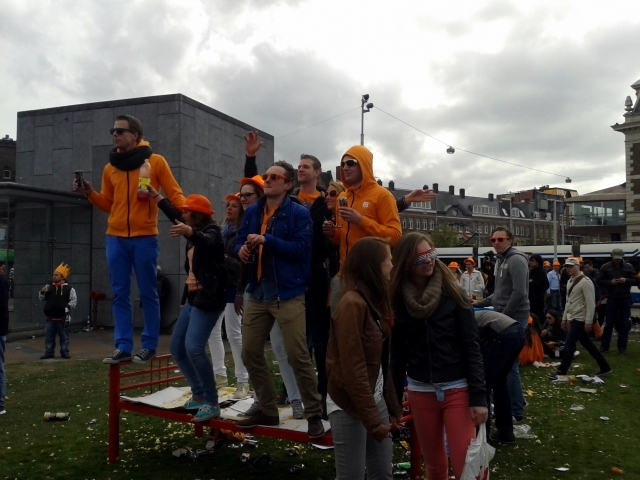 Instead, Queen's day was celebrated at the end of April, a better weather-prone date. Sadly, Queen Beatrix announced her abdication in January 2013, to let Willem Alexander, her eldest son, step up to the throne. 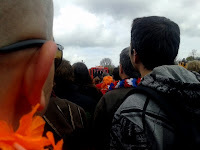 Thus, April 30th 2013 would be the last Queen's day and as such, would have to be the biggest and most orange birthday party ever. Known worldwide for being extremely liberal and multi-culti, the Dutch seem to embrace with equal enthusiasm legalized (and taxed!) prostitution and regulated (and taxed!) sale of marijuana as they celebrate the investiture of the new king. The celebration started a few days before April 30th, with the mass sale of orange paraphernalia to show your support for the royal house of Oranje-Nassau (whose color as you may have guessed by the name is, indeed, orange). 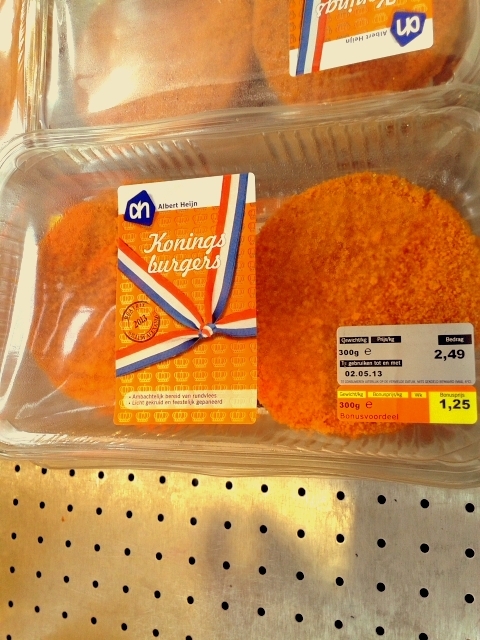 Orange t-shirts, orange blow-up crowns, orange flags and, of course, orange hamburgers for your barbequeue. A few days later, by the time we had our orange gear ready, on April 30th, Queen Beatrix became once again Princess Beatrix by signing an abdication document in Amsterdam and the crown prince Willem-Alexander became King Willem-Alexander. 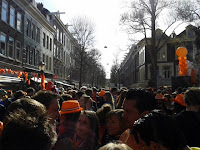 A sea of people flowed into Amsterdam. Some came to cheer for their new monarch. Some came to spend an agreeable day at the park with their family, skipping rope with other fellow orange-fevered Dutchmen and trading all sorts of junk at the Queen's day flea market. 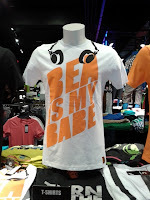 Others, with lower ideals, just went to Amsterdam to dance and drink beer. 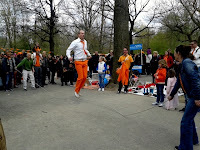 Grown men dressed in orange rope-skipping and some guys who bought a bed at the flea market, to dance on it to the sound of the ever-present oompa-pa music. While we didn't see that many people on the train to Amsterdam, we did have to fight the masses once we got out of the train station. We fought the masses on Museumsplein to catch a glimpse of the investiture of King Wilhelm-Alexander on the giant screens. We fought the masses to get a chance to pee and then for lunch. And finally, we decided to stop fighting the masses and just climb on a bus where a DJ was playing and dance. We enjoyed the last rays of sunshine while sitting in the middle of a street, tried to hitch a boat ride on the canals (but the captain was apparently too drunk to maneuver and almost crashed into another boat) and then we danced some more in the midst of a electronic music war between two DJs on the opposite sides of the street. The exhausting trip back home was surprisingly tranquil up unto the train station in Arnhem, where apparently half of Nijmegen's population and their mother had been partying. The short trip between Arnhem and Nijmegen was done with a colorfully drunk and loud crowd dressed with torn orange capes, broken orange crowns and dirty orange hats. The party must have been quite good as well in Arnhem. All in all, the last Queen's day in the Netherlands was fun. It's some sort of exercise in Dutch integration because it actually doesn't matter if you're Dutch or not or whether you are a firm supporter of the Dutch Royal house. It's about whether you are willing to be part of something by putting on something orange to dance and drink beer with the liberal, multi-culti, maybe monarchy-supporting crowd who otherwise regularly enjoys steep stairs, bizarrely accurate gift cards for all occasions and cursing you with diseases. 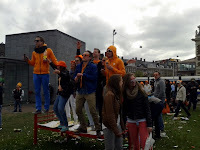 Queen's day was epic, but I can only wonder if King's day in 2014 will have the same oomph. But yes, there's only one way to find that out.